Merry Christmas from Kris and Jim. I made this short video on my iPod Touch with iMovie. I did the music with MIDI in Music Studio on my iPad. We figure things out – shape, edges, distance, and more – using values (light and dark). Color is secondary to our understanding of the world. Values are therefore more important than colors in a painting. Here’s a slideshow that shows a value sketch, a painting with color added underneath the value sketch, and finally just the color. (Of course colors have their own values). I like to do quick value sketches on location before starting a painting. Its a tremendous help in planning the basic structure and exploring what’s important in the scene. 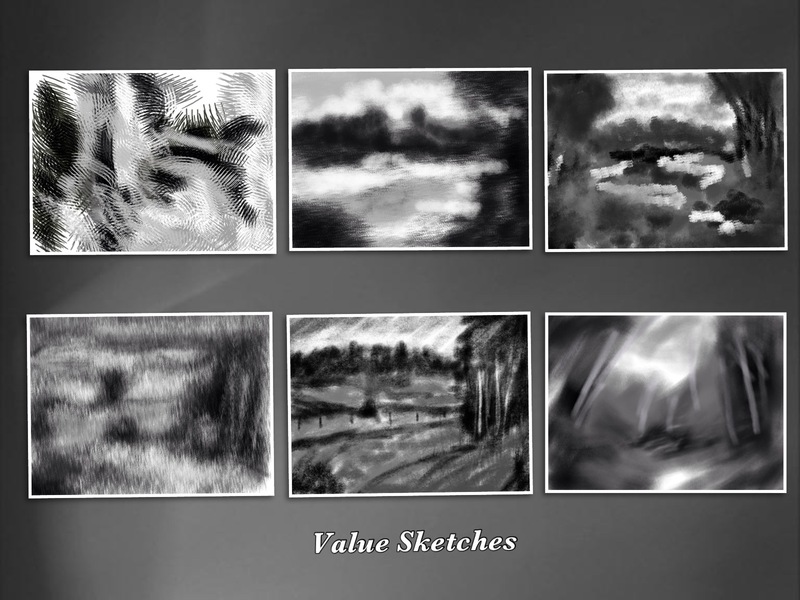 Traditionally artists have used pencil, charcoal, or ink to draw value sketches. I thought I’d explore using the iPod Touch instead. It’s the right size – screen size is about 2 x 3 inches which is the size I usually make in a sketchbook. It’s also handy. It fits in my shirt pocket and I always have it with me and I already use it to take reference photos. I experimented with several different painting apps. I first used Sketch Club which I like because I can make custom brushes and it has an eight step grayscale color palette. I also tried ArtRage and Sketchbook Mobile, but rejected them. ArtRage on the iPod creates files which are too small and Sketchbook has too clumsy an interface. I really like Procreate on the iPad, but the iPad is too big to carry around conveniently. The best was Brushes. It makes nice large files and you can playback a movie of your painting process. Here’s a sample. Made this movie a while back using Brushes on the iPad.